A big-shot marketing pro and hefty budget aren’t required to successfully market your small business. In fact, businesses everywhere use email marketing as a powerful tool to build customer relationships and attract and retain new clients. No matter your business, email marketing can work for you. If you’re not already leveraging the benefits of an email newsletter, it’s time to jump on the bandwagon. Successful businesses work to ensure their newsletter designs are visually appealing and engaging to keep customers from immediately clicking the delete button. 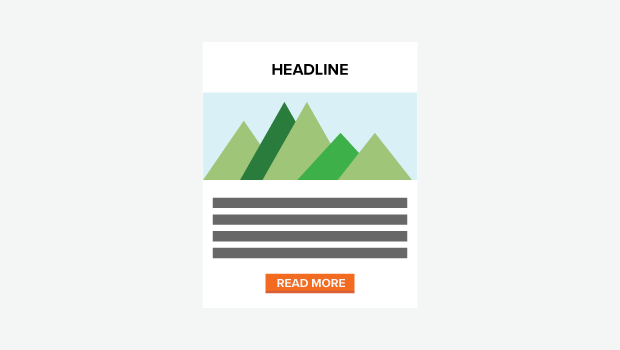 Before you even think about your design, you’ll need to decide on a purpose for your newsletter. Are you trying to drive traffic to your website, talk about new products, educate and inform your readers, or all of the above? Your goals will be the force behind the design and distribution of your content. Just because someone signs up for your email list doesn’t mean he or she is actually going to open every email. This is where the subject line comes into play. The key is to give your readers a reason or incentive to click on the email right away. Get creative with a new, out-of-the-box subject line for each email you send. A header should include the title of your newspaper, your company name and logo. There’s no need to find someone with graphic design experience, because you can easily create your own header using online DIY tools like Share As Image and Pixlr. Let your logo inspire the color scheme, using your company’s colors for borders and fonts to create a cohesive layout. A newsletter is not the time to start experimenting with fancy fonts. Pick one basic font, like Arial or Times New Roman, and use it consistently throughout the entire email. Don’t intimidate your readers with one giant chunk of content. Instead, break it down into short sections with subheadings so it looks and reads more like a newspaper. If possible, use a template through an email service provider. This allows you to simply select a template, upload your photos and start writing. Take your email marketing efforts even further by linking with your social media accounts. Include links to each social account where current and potential customers can click to follow you on the channel of their choice. Your email subscribers want to know: What’s in it for them? They didn’t join your mailing list just to read about your products or your latest promotional offer. As a rule of thumb, your newsletter should be 90 percent educational and only 10 percent promotional. Stay away from self-promotion and focus instead on creating a relationship with your customers by providing them with educational and relevant content. Get ready to launch your email newsletter and watch it thrive. Grab the attention of your audience with a clean design and digestible content. With these tips, you’ll increase readability and customer engagement in no time at all.